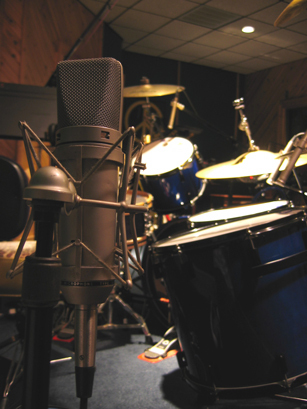 Large-diaphragm solid-state studio standard microphone for over thirty years, descended from the reknowned U67 tube microphone. Includes switchable cardioid, omni, and bidirectional polar patterns, hi-pass filter, and 10dB pad, with both spiderweb-type shockmount and regular stand mount (less obtrusive for close-miking). Especially nice for trumpet, congas, acoustic guitar, drums, spoken word recording, some vocalists, and ambient miking. This is the microphone aesthetically that many manufacturers have copied. This particular U87 came from the old Audio, Inc. studio in Charlotte.